For many years, vitamin C has been a popular remedy for the common cold. Exposure to light can also reduce vitamin C content. Choose orange juice that is sold in a carton instead of a clear bottle. Vitamin C is an easy supplement to get through diet but many of us want to make sure in the winter we get enough! Try taking a Citrus or Aqua Zinger along with your fresh water for an added fresh fruit cocktail. Here are supplements that are not costly but can help keep you healthy this winter. Springreen Natural Source Vitamin C is deceptively affordable. The cost of a single jar is $26.55 for 120 tablets. The daily serving size is 1. So that is $0.22 for a daily supplement of Vitamin C.
For those that don't like taking or can't take pills or tablets, here are options! 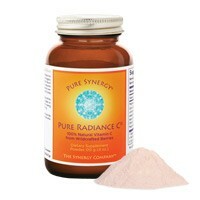 Pure Radiance Powder from Synergy is in powder form. The dosage is 1/4 teaspoon for 180 servings at $24.95. Typically, Vitamin C is not available in a liquid. If you are seeking a liquid alternative, our Yes Herbal Liquid has Vitamin C.